The White Beach is the best known, longest and possibly the most beautiful beach of Boracay. It is about 4 km long and it takes up most of the western side of the island. It is also the jewel of the island. 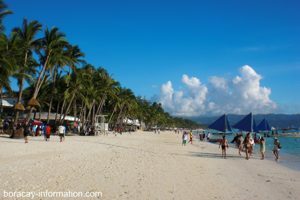 The White Beach is of course also the busiest beach on Boracay Island. Numerous hotels, restaurants, bars, dive shops, ice cream parlors and souvenir shops line up along the beach front and battle for the many customers from all over the world. There are no vehicles allowed along the beach, it is a pure walk way. This walk way is connected to the main road by several narrow side roads, where you can also find some fine restaurants. Especially in the evenings when many tourists walking along this beach front makes up the whole feeling at the White Beach. Every few hundred meters there is a live band playing and the scents of the many BBQ's reach your nose and makes you hungry. Due to this many activities it is anything but quiet along the White Beach on Boracay. So those who prefer absolute silence during their holiday, should better opt for a hotel in one of the side streets and a little bit away from White Beach. The White Beach is divided into three imaginary zones of the former boat stations 1 to 3. Previously, the boats from Caticlan went straight to White Beach and stopped at three different places to drop the tourists literally right in front of the hotels. This subdivision of the beach is still preserved, although the boats do no longer travel to the beach directly, but take all the tourists instead to the new Jettyport in the south of the island. Station 1 marks the northern part of the beach, station 2 is in the middle of the beach and station 3 is located in the southern area. In the central beach area, i.e. in the area of Station 2, now all the boats are banned so this area is suitable for swimming safely and comfortably. 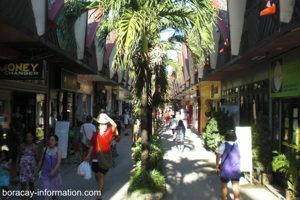 Also in the middle of the beach is the D'Mall, a shopping arcade as a link to the main road from the beach. At the D'Mall you'll find a few hundred shops, restaurants and snack stalls, which are well attended throughout the day and of course also in the evenings.